I can't seem to bring myself to post about Christmas just yet. We are still only in mid November and until we are officially into December, then will I allow myself to get excited over Christmas. 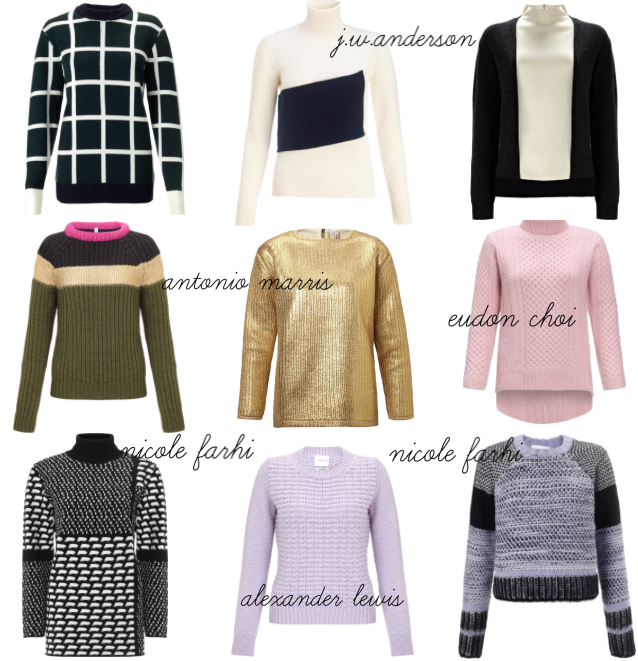 Christmas festivities and festive jumpers aside I've created an autumn winter inspired knitwear wish list. Yes, these brands are high-end and luxurious, not to mention slightly out of my price range but a girl can lust can't she? Plus, what is Christmas for!? You all know I've got a thing for J W Anderson especially the monochrome checked knit I am yet to get my hands on. But, Friends and family, if your reading this I wouldn't mind settling for either Nicole Farhi tweed blend jumper! Layer either knit over the top of a crisp white shirt long sleeved shirt, a pair of jet black skinnies and a pointed court and you've got yourself an on trend, autumn winter appropriate ensemble. Santa, please?